Article first published as Book Review: ‘The Hunter: Awakening’ by Nicholas Arriaza on Blogcritics. Set in Los Angeles, “The Hunter: Awakening” is a multilevel story about family, betrayal, and the battle of good versus evil. From a tomb hidden deep in the California hillside, a fierce creature steals a large leather-bound ancient volume. In its haste to deliver the book to its new master, the beast fails to secure the entryway to the tomb, and a young hiker stumbles upon the elaborate cave, unintentionally awakening a fearful being set to rest in the tomb over two hundred years ago. Meanwhile, a young and pregnant neurosurgeon, Melisa Castro, enjoys a rare day off lounging by her poolside when a man suddenly falls from a cliff directly into her backyard. Melisa is compelled to help the man who is emaciated and has no memory of who or where he is. A vampire looking for the awakened being, and a power struggle with the family of Melisa’s fiancé Chris, adds to the drama. Chris is not who or what he appears to be either, and hasn’t been that forthcoming with his fiancé. He just can’t seem to find the right time to tell Melisa she is carrying a werewolf’s baby. Wow, I was totally captivated with this story. Nicholas Arriaza does a remarkable job with his debut novel, crafting a thrilling, fast-paced journey, and taking readers through layers and layers of blood-chilling entertainment. The story is very well written, offering a stimulating fresh take on werewolves, vampires, and theology. The world he built successfully intertwines historical backdrops with modern times, displaying clear and genuine visions easily imagined by the reader. Topping the robust settings, the characters are the leading attractions in the story. So well developed, I had no trouble connecting with each of the main characters. Arriaza brings his characters to life, displaying their quirks and mannerisms with complexity, detail, and richly designed personalities. I particularly enjoyed making the comparisons between Melisa’s family and Chris’s family. Two dramatically different families and upbringings, they vividly show the author’s ability to create unique and individual characters that draw the reader in, investing them in whatever happens next. 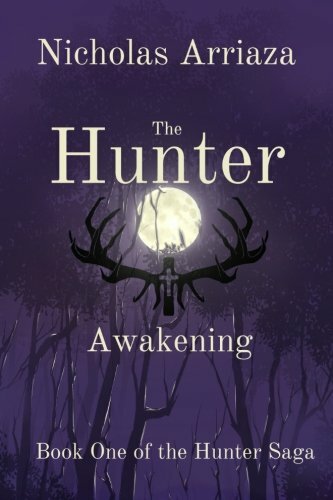 Overall I found “The Hunter: Awakening” to be an engaging book that I highly recommend to fans of horror, vampires, werewolves and fantasy. Well-written and suspenseful, the unexpected plot twists and dramatic ending set the pace for a successful series. I look forward to the next installment in ‘The Hunter Saga’ by Nicholas Arriaza.